Facebook India today announced launch of “India Election Tracker”, an app on Facebook that will give live information on how various election candidates and parties are faring on Facebook. The launch of the app comes on the eve of Facebook Talks live that will be conducted on March 4th to 8th between 8pm-9pm. 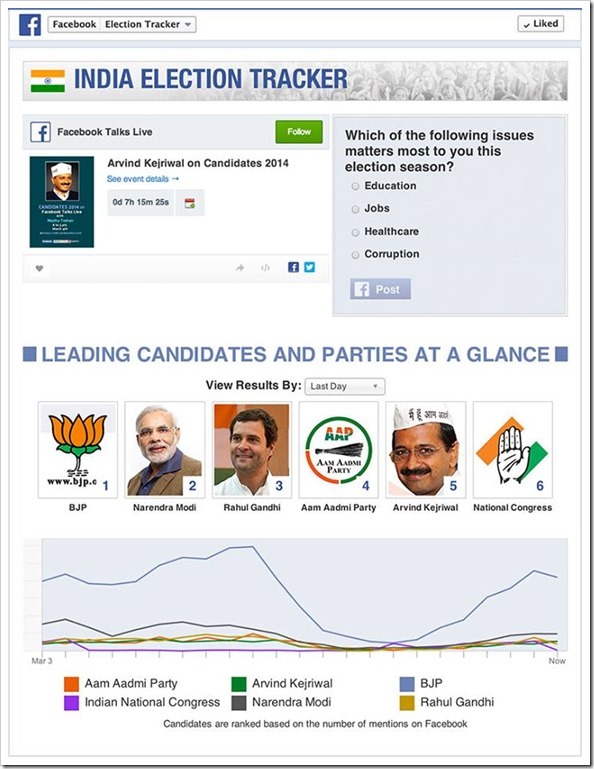 The Facebook App “India Election Tracker” is a dashboard where app users will be able to watch the Candidates 2014 livestreams, take a poll about the issues that matter the most to them in the election as well as compare how much the Facebook community is talking about leading candidates and parties over time. It is quite similar to the comparison we carried out yesterday on Trak.in comparing how leading Indian PM candidates fared online. However, the app will provide a live stream, giving users a upto the minute view of various candidates and parties. The way elections are fought now have gone through a sea-change, thanks to technology and internet. Previously, it was impossible for an ordinary citizen to interact with political candidates, but now they have numerous channels through which they can make their voices heard. Political parties like BJP and AAP have derived tremendous advantage through their Facebook pages and Twitter feeds. While Facebook has already launched their political tracker, I am sure something similar will coming up from Google India headquarters as well. General Elections 2014 is a major event for India, and I am sure companies like Facebook, Google and Twitter will make most of it as well!